This simple and nice product supplied by Alternative Aquaculture, Lofthouse. This conical hatching jars was fabricated in clear plastic. Ideal for the incubation and hatching of both fish eggs and brine shrimp. Can be made in a variety of sizes to suit an individuals requirements. The hatching jars have an integrated spout at the top to allow the water/hatchlings to swim out into the hatching tanks. 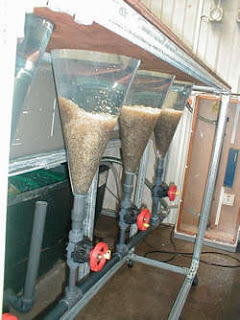 Easy to regulate the water flow precisely to suit the stage of development the eggs and to check them for any signs of infection. Picture of the product is shown below.